Welcome! If you're following along with the Gossamer Blue Blog Hop, you should have arrived from the lovely blog of Michiko Kato. Are you getting lots of ideas for using your January kits? Have you started thinking about Valentine's Day yet? 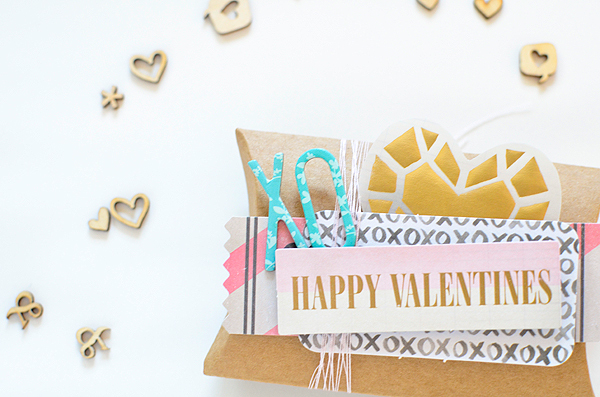 If not, I've got some Valentine treat boxes to share that will help get you started. 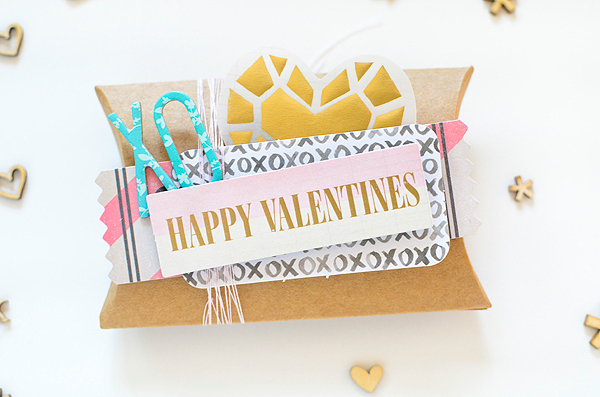 The January kits featured several sweet heart-themed embellishments and they made creating Valentines a snap. I started by filling these small pillow boxes with Conversation Hearts. 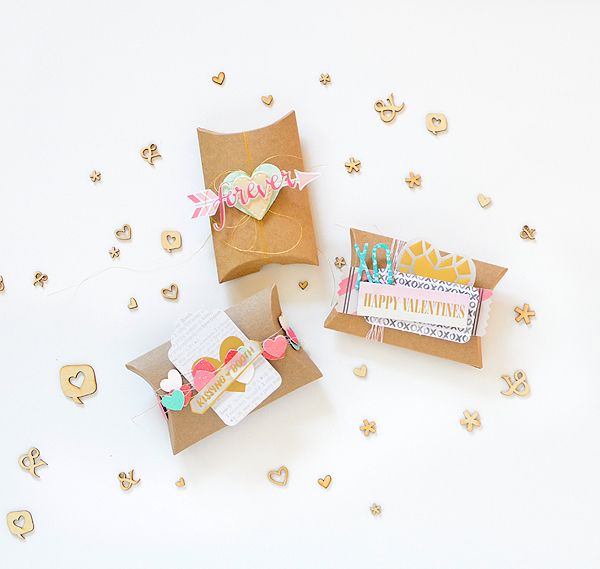 Then I gathered up all the cute products from the January Main Kit to decorate my boxes. First, I stacked the Kiss Kiss Ephemera pieces together to create eye-catching arrangements. Here, I also added an X and O from the Serendipity Thickers for a pop of turquoise. And finally, a bit of pale pink thread wound around the box several times added a little more texture. Whenever I wrap packages, I always consider using as many textures as I can without overwhelming the project. I could have kept going here, but I wanted these to be very quick little treats. I tied more thread around this forever box, but used metallic gold this time. 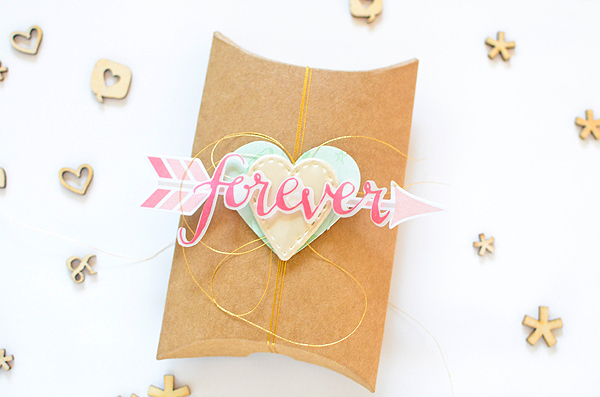 The faux leather heart has a bit of a sheen to it and it pairs so well with the gold thread. Maybe it even looks a little classy? For the last box, I looked at the sheets of glitter hearts from Pebbles and decided that they'd make an easy--and really pretty--garland. I used white thread this time, and spaced pairs of hearts every 3/4 of an inch apart (sticking them back to back). Even though the hearts are sticky already, I added a dab of glue to each pair to make sure they wouldn't come apart. I wrapped it around the pillow box and added a tag and vellum sentiment. I wanted the strung hearts to stand out a bit so I stayed with simple, neutral-colored embellishments. One thing I love so much about the Gossamer Blue kits is how, even though they are comprised of pieces from several different manufacturers, it is still so easy to combine all of the different products into one cohesive project. 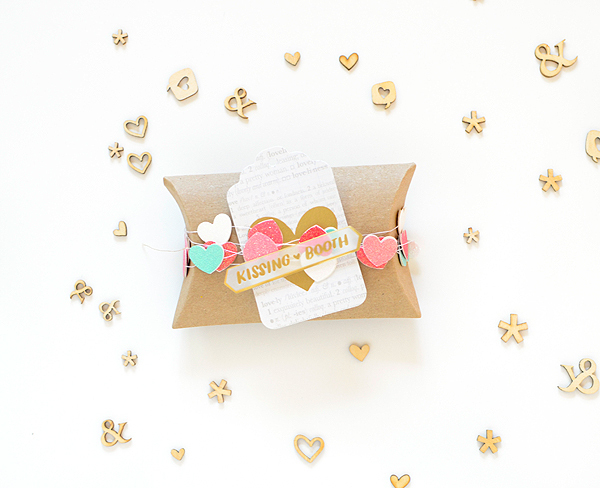 I hope you found a bit of Valentine inspiration here...and now you're off! Say "Hello" to the sweet Sabrina Alery for me--I know she's got something wonderful for you. Too cute!!! 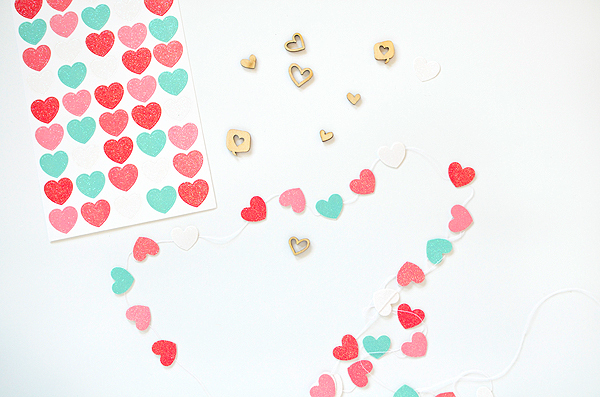 Love how you made that garland from the little heart stickers!! What a great idea! Gorgeous! 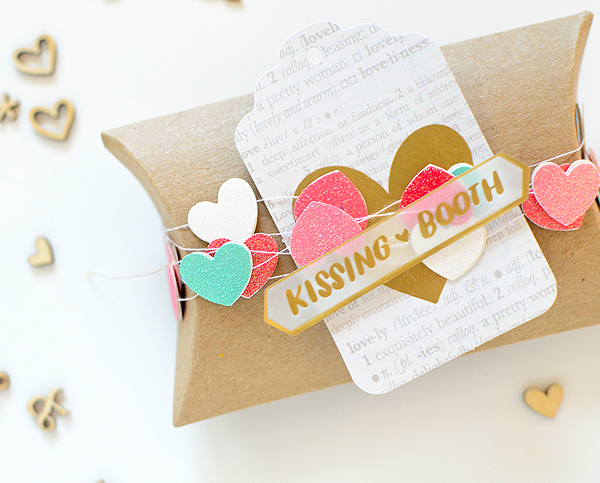 I love the heart sticker garland too! All so pretty! 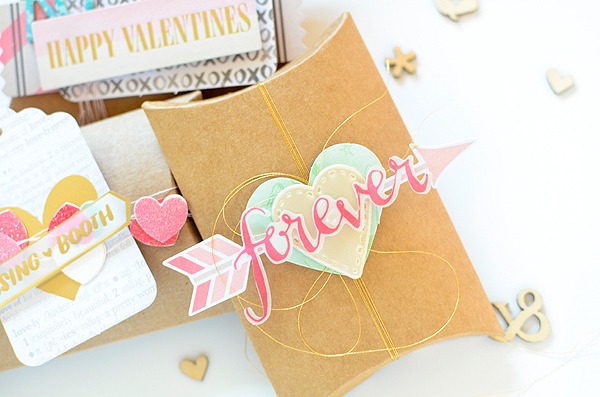 That sticker heart garland....WHAT?!! 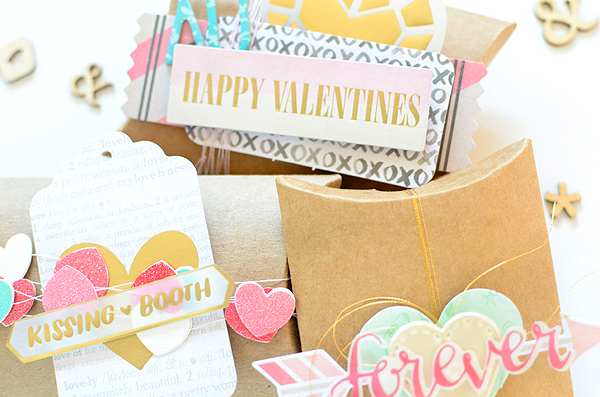 super pretty packaging...love the layers. : ) so lovely heart chain!!!! Who wouldn't love those gift boxes!! Just yummy! wow so beautiful and creative! !